Dr. Gray Brechin is an historical geographer, the author of Imperial San Francisco, a frequent radio and television guest, and a popular public speaker. He is currently a visiting scholar in the U.C. Berkeley Department of Geography and founder and project scholar of the Living New Deal. 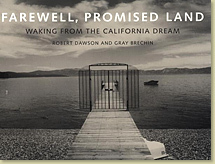 Interview with Gray Brechin discussing the drought and its consequences for California's future. When President Franklin Delano Roosevelt enacted his New Deal programs in the 1930s, John Boettiger, of Mill Valley, was just a baby and knew the president as "Papa." No other nation in the world possesses the cultural heritage so nobly embodied in America's prewar post offices and the New Deal works of art they often contain. 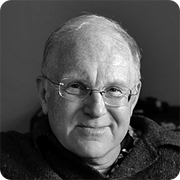 Read Gray’s articles from publications including Antipode, The New York Times, and Focus. 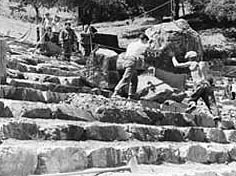 October 10, 2018 "The Lost Ethical Language of New Deal Public Works"
October 2, 2018 "The New Deal and Labor"
September 15, 2018 "Bringing the giant WPA relief model of San Francisco back to life"
September 12, 2018 The Cal Stadium, "A Monumental Memorial to Denial"
September 9, 2018 "Storms, Droughts, Floods: Classic Documentaries"
August 1, 2018 "First Wednesday: Recovering from The Depression with Dr. Gray Brechin"
May 8, 2018 "Recovering from the Depression: How President Roosevelt's New Deal Catapulted Sonoma County into the 20th Century and our Retreat to the 19th"
June 2, 2017 "Rediscovering Architect Herbert Maier: A New Deal Renaissance of the Arts & Crafts Architecture in the National Parks"
April 12, 2017 "The Living New Deal and Its Impact on Marin"
March 21, 2017 "Sending the Overhead Downstream: Hydraulic Mining and the Oroville Dam Disaster on California’s Feather River"
September 7, 2016 "Recovering from the Depression: The Enormous and Invisible Legacy of New Deal Public Works in Sonoma County and Beyond"
August 24, 2015 "The Art & Architecture of the New Deal in San Francisco"
In the depths of the Great Depression, President Franklin D. Roosevelt promised the American people a “New Deal.” Over the decade 1933-43, a constellation of federally sponsored programs put millions of jobless Americans back to work and helped to revive a moribund economy. The result was a rich landscape of public works across the nation, often of outstanding beauty, utility and craftsmanship. The Living New Deal is a UC Berkeley-based initiative dedicated to inventorying and mapping these works. It has created a guide to the Art and Architecture of the New Deal in San Francisco, a pocket map and guide to 18 spectacular New Deal sites in the city. Join us and geographer Gray Brechin as he discusses the impact of the New Deal on San Francisco and introduces the new map. Registration and further information. July 23, 2015 "PPIE Citywide Celebration at Mechanics’ Instituter"
The Grand Design: PPIE and the “City Within A City” - Panel discussion moderated by Laura A. Ackley, author of San Francisco’s Jewel City: The Pan Pacific Exposition of 1915, with Gray Brechin, Kerry Laitala, Therese Poletti and Christopher VerPlanck. Architectural historians, writers, and artists will discuss the collaboration of Edward Bennett and the Exposition’s architectural committee whose vision of the Block Plan manifested the design of the PPIE. Innovation, fantasy and technology created this “city within a city” which included great architecture, urban design, and leaps of the imagination. The influences of this model city on San Francisco’s development will be brought into perspective. Conventional orthodoxy—often referred to as “Smart Growth”—says that in order to achieve urban “vibrancy,” communities should fill their downtowns with high-rise residential towers and line their arterial streets with mid-rise, wall-to-wall apartment buildings above ground-floor commercial spaces. Can Berkeley’s city planning history show another way? Berkeley is one of the most densely populated cities in the United States with more than 10,000 residents per square mile, but has achieved this with: most buildings rising only one to three stories and surrounded by actual (not polemical) “green”: low rise but successful commercial avenues: sunlight, air, and views widely available, not just for the wealthy. Join us on June 24 and July 22 for a two-part discussion of how Berkeley got to this point, and where we might go next. Against the backdrop of early Hillside Club efforts to maintain and enhance the natural beauty of the Berkeley hillside, we will look at Berkeley’s planning past, including the largely forgotten “Hegemann Plan” of 1913-15 which recommended a waterfront park, development of a civic center, and many farsighted neighborhood improvements for Berkeley and Oakland. The discussion leader on June 24 will be Steven Finacom, past president of the Berkeley Historical Society and a frequent writer on local history and preservation issues. At the July 22 Round Table the topic will continue, with noted author and geographer Gray Brechin as discussion leader. The Living New Deal is an unprecedented and growing collaborative effort to identify, map, and interpret the vast public works legacy of President Roosevelt's New Deal in the U.S. Supported by donor contributions, the Living New Deal is hosted by the Department of Geography at the University of California Berkeley. In addition to our interactive website, illustrated talks, and tours, our long-range goal is to establish the nation’s first museum and memorial to the men and women of the New Deal. 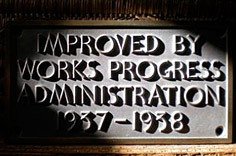 It will also serve as a study center to keep the New Deal’s comprehensive moral vision alive. View the video introduction. Dr. Brechin has tht since 1986 at numerous institutions, including U.C. Berkeley, San Francisco State University, Mills College, California College of Arts and Crafts, and University of California Extension. See all teaching work.